Most of us have seen commercials for psoriasis medication or know of a friend or celebrity that’s afflicted with this skin condition. However, many individuals may not be fully aware of the symptoms, triggers, and risk factors associated with psoriasis. Psoriasis is a chronic skin condition characterized by overproduction and rapid growth of skin cells. These factors lead to cell build-up on the skin’s surface that may appear as a few flakes in some individuals or as large, scaly patches in others. Patients with psoriasis can present in a variety of ways. The condition can appear as red patches of skin with silvery scales (plaques) or as dry and cracked skin. It can also affect finger and toe nails, causing them to become thick and discolored. Patients may also experience psoriasis-related joint pain, swelling, and stiffness. Who’s at risk for psoriasis? Individuals with a family history of psoriasis are most at risk for the condition. Additionally, bacterial and viral infections, compromised immunity, stress, obesity, and smoking can all contribute to psoriasis. The exact cause of psoriasis is unknown. However, researchers believe that it is linked to the immune system and occurs when T cells attack healthy skin cells. As a result, there is an increased production of new skin cells that move up to the skin’s surface more quickly. The accumulation of these rapidly growing cells causes the red patches and silvery scales (plaques) that are commonly seen with psoriasis. Patients can identify and manage their psoriasis triggers which often include: Bacterial or viral infections, injury, stress, smoking, alcohol, vitamin D deficiency, and certain medications such as lithium. Psoriasis is often diagnosed with a physical exam and patient history and a skin biopsy. Treatment options can include topical creams, light therapy, and oral or injected medications. 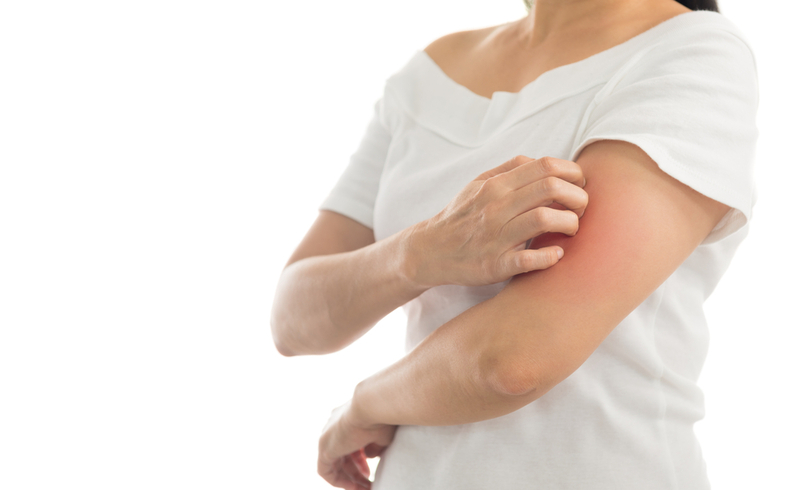 To learn more about psoriasis and treatment options in Hagerstown or the surrounding Frederick area, contact us today to schedule a consultation.